The Monsoons are a perfect season to try out some piping hot snacks and enjoy them while it is pouring outside, isn’t it? The simple pleasures of life are obviously those where you get to prepare & eat snacks which your mother used to prepare (this is for all of us who no longer live close enough to bug our moms to make something for us). I don’t know if I lived all my years in Mumbai turning a blind eye to all the seasonal goodies that flood our markets because I was simply thrilled to find Turmeric leaves this time and I immediately decided to buy some to make my most favourite tea time snack which my mom & grandma used to make in abundance. 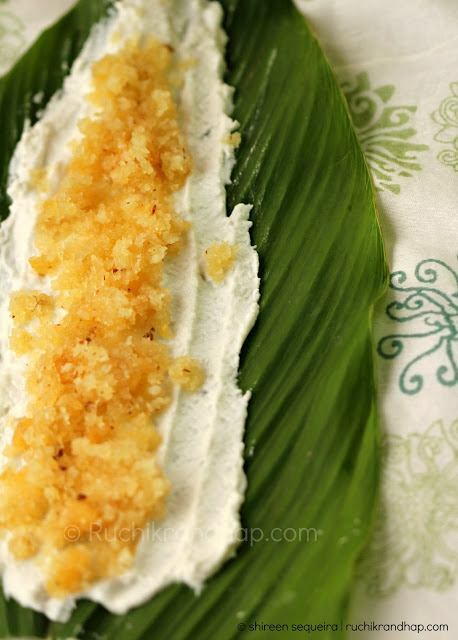 Delicately sweet rice dumplings – not round and fat looking as the word ‘dumpling’ immediately translates, but a thin, flat & long rice cake packed in a fragrant Turmeric leaf. Turmeric is widely used in South Asia for cooking and medicinal purposes and I think we’ve all grown up watching the quintessential Maa in Hindi movies bringing her son a glass of Haldi wala Dhoodh (Milk with Turmeric) for good health and as a cure for minor ailments. Turmeric is known to rid one’s body of any allergies too. It is one of nature’s most powerful healers. Besides being a natural antiseptic and antibacterial it is also used in beauty treatments. How can we forget the Indian brides who look resplendent with a glowing complexion on their wedding day especially after an auspicious Haldi ceremony that is conducted 1-2 days before the wedding? 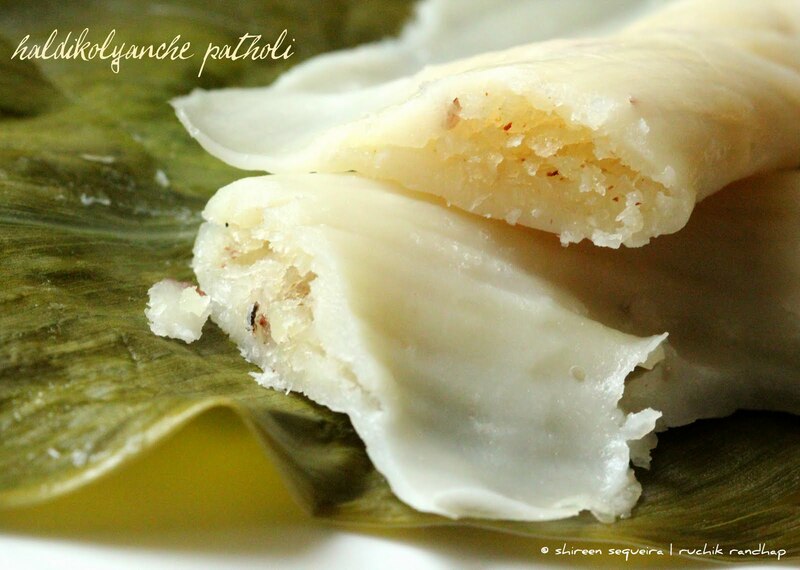 So here it is – the Turmeric leaf Patholi – delicately fragrant & deliciously simple ~ rice, coconut, jaggery & cardamom mixture filling ~ a sweet dish that delights everyone! 3. In a bowl mix together the freshly grated coconut, grated jaggery and cardamom powder and blend well so all the juices incorporate. Ensure that there are no lumps of jaggery in the mixture. 4. On a clean working surface place a leaf and starting from the end of the stem, place a small portion of thick rice paste and spread it across the length of the leaf using your fingers (all except the thumb). Leave out the edges to avoid spilling of the batter when you press them closed. The rice paste should be applied as as thin a layer as possible. 5. Place the coconut & jaggery mixture along the spine of the leaf (right in the centre). 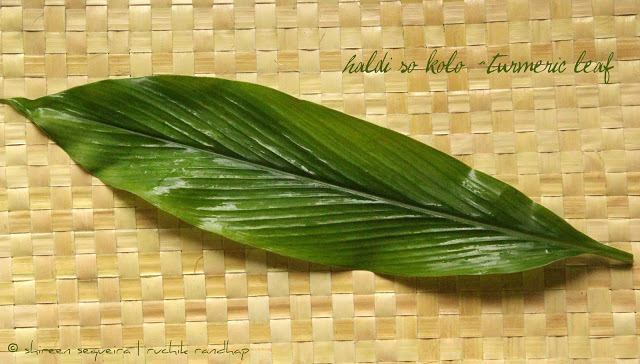 Fold the leaf along the spine (vertically) – this is how we make it but you can fold it horizontally as well. 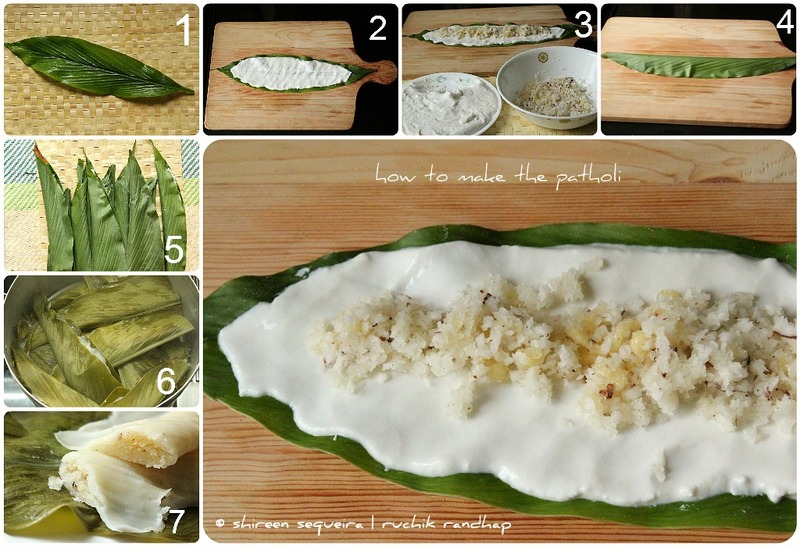 Continue this process until all the leaves/rice paste is used up. 6. Place a Tondor or steaming vessel with sufficient water on a high flame. When it comes to a rolling boil, place the Patholis on the plate inside the steamer. You can stack them up or place them strategically so that all of them get steamed evenly. Cover and steam for 18-20minutes on a full flame. If you get the Mangalorean variety of Turmeric leaves (which are slender, delicate and more fragrant) you will need more as they are smaller in size. I found large ones in Mumbai and had to cut most of them into half, these are broader at the centre so you can put more filling inside. That sounds so authentic n really intriguing ~ thanks dear for sharing! Delicious looking sweet dumplings. Excellent preparation. Shireen, how do you grind the rice? In a grinder or mixer? What exact information are you looking for Mayur Suvarna? Banana Leave sweet gutti is all time favorite in our home. we tried it Turmeric leaves and it turned very delicious. this website is one stop visiting place for our family for all mangalorean dishes. 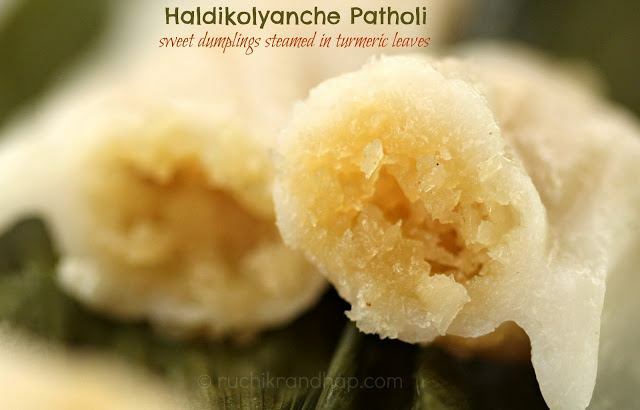 I so glad you enjoyed the turmeric leaf patholi!! Thanks a lot for your feedback Atul! Glad to know that your family enjoys my recipes!